Features of Ms-Access . Ms-Access course also enables the student to utilize, the features of database taught in this course in an office environment with maximum efficiency. I have completed my advance excel course from Softpro Computers in matunga. I got to learn many new things in excel. Also the teaching faculty is excellent. 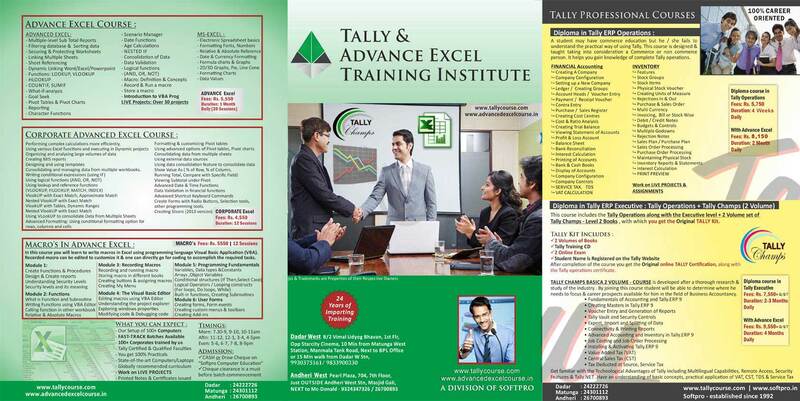 I have done my advance excel and tally training from matunga branch. It was a good experience and i have learnt alot which will help me in my career. I have completed my Masters in Advanced Excel from Softpro Computer Institute..it was an awesome experience with Professor Sushil Mohan Sir and have cleared all my concept and have become Expertise for the same..Thank You So Much..!! I have done My MS office, excel advance and Ms access from softpro institute. The professors and staff are very cooperative and understanding towards students. they give attention on detail. i am very pleased with the result. I have done my Advance Excel Course. Course is very useful and faculty and other staff is very good. It real add value to my knowledge. Doubts are clear on time. Having good number of example to explain. I have done my advanced excel training from Matunga Branch. It has been a wonderful learning experience. I recommend Softpro to everyone wishing to learn Advanced Excel. Rakesh Sir has been one of the most patient faculties I've ever come across. His subject matter is very strong and we as students have learned immensely under his guidance and teaching. He is always ready to resolve queries and is available when needed. I wish him all the best in all his future endeavours! I have done advance excel course from mantunga branch.it was very nice institute which help me to improve more knowledge about the excel ,and specially thanks to my sir who teach me very friendly way clearing out my each and every doubts .and also there class coordination about their students it was very nice . that's why i have given as 5 star rating . i would like to say please go take advantage of source like that you can improve your skills and knowledge. 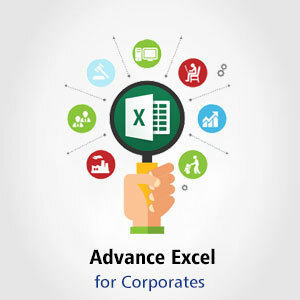 i have done my advance excel course from matunga branch. The training is really good and helpfull. will recommend this to everyone who wants to join. I have done my Advance excel training from Matunga branch. The Training was really Good and Sushil sir has been very patient. Will recomend this to everyone who wants to join. superb institution for all the computer courses. Sushil sir has been so patiently teaching me and has answered all me quieries. Highly recommended . Thank you Softpro. I have done my Advance Excel Training from Matunga Br. It was a good experience learning at this particular institute. The Material provided is helpful and in proper language. Trainer Sushil Mohan has an excellent knowledge and supports you with all the information required. I would highly recommend this institute for anyone. i have done my advance excel course from softpro matunga branch,it was good teaching.facalty is nice here they answer properly n clear doubts . I completed my advance excel course from softpro computer education (matunga). It was a great learning experience. The staff is good and helpful. I have done advanced excel course from softpro matunga had great experience and knowledgable faculty. Every student is given separate attention no group teaching. I have completed my advanced excel course from softpro dadar. The overall experience has been good. i was trained under Prof Harish and he has been very polite and professional throughout. I have done my advance excel & Macros classes from the matunga branch & I have had a great experience & rapport with the faculty. He is very knowledgeable & has most of the solutions to excel. I came here to learn basic & advance excel. Here the faculties are very good & environment also very good. I learn everything in excel from harish sir in softpro. So , I am also advising people to please prefer softpro if you want to do any course for e.g. Digital marketing , advance excel, tally, autocad, etc.